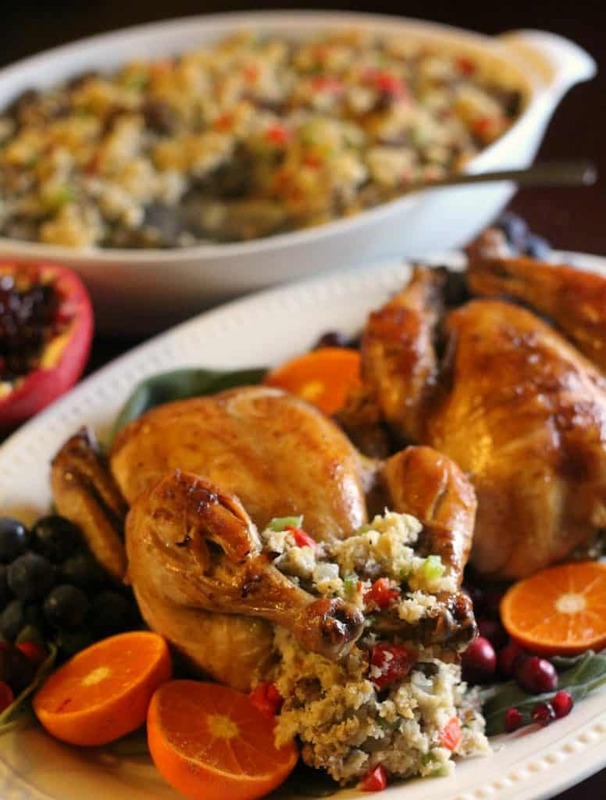 Are you looking for recipes to create a holiday meal that will wow your friends and family? Maybe traditional holiday fare with a flair? Well then, buckle up! 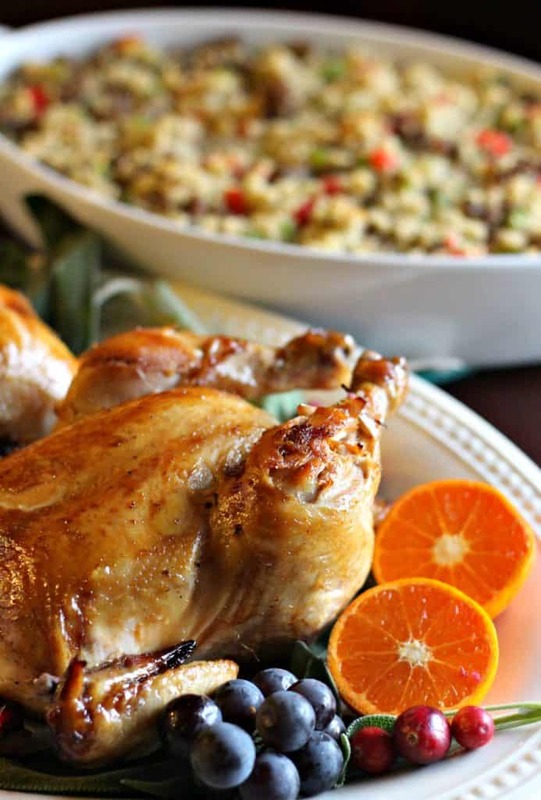 Citrus Soy Glazed Cornish Game Hens with Panko Sage Stuffing is sure to delight your taste buds. This is a meal to remember! The game hens are marinated overnight to allow the seasonings to soak in to the meat. 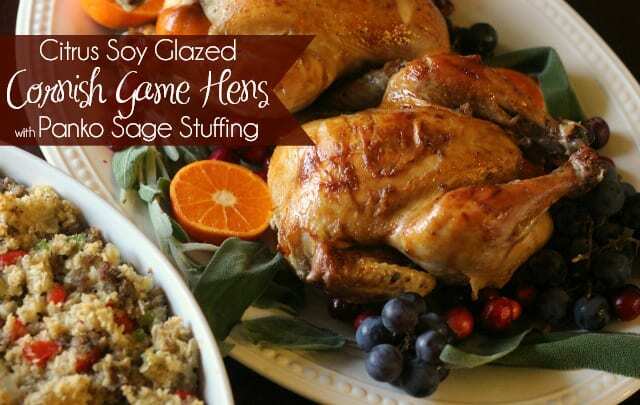 While the game hens bake in the oven, you’ll create a glaze that will be brushed over the top of the hens to add even more flavor. Delicious! I love panko. It adds a delicious crunch and texture to recipes. 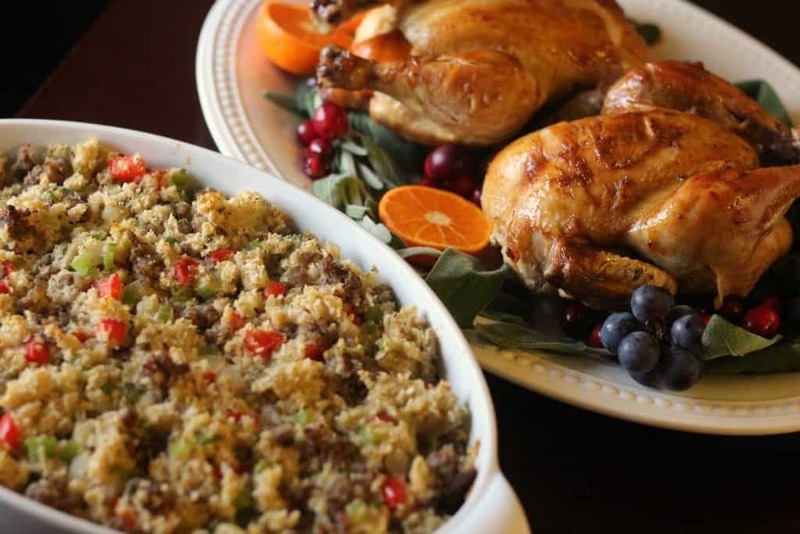 Since I was planning a holiday menu that would offer a fun twist on classic recipes, I decided to use Kikkoman® Panko Bread Crumbs to make a stuffing for the game hens. Oh yes, it was a really good idea! I used the traditional Kikkoman® Panko Bread Crumbs in my stuffing recipe, but I’m sure the gluten free variety would work as well. Try it and let me know! It’s so great that Kikkoman® offers Gluten-Free products certified by the Gluten Intolerance Group (GIG). Kikkoman® has many sauces, marinades, and other products that can help you create so many delicious recipes at home. Learn more at KikkomanUSA.com. As I mentioned above, the Cornish game hens will marinade overnight. 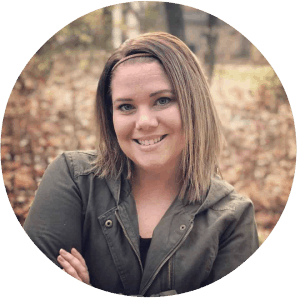 Be sure to allow time for this process. Also, be sure you have kitchen twine, a meat thermometer, and a basting brush. These may not be items you use often, but they’re necessary for this recipe. You may be a bit surprised that I bake my stuffing in a baking dish instead of stuffing the hens. The is for a few reasons: first, the hens are small and not as easy to stuff as a big turkey. Second, I prefer the method of cooking the stuffing in its own dish. 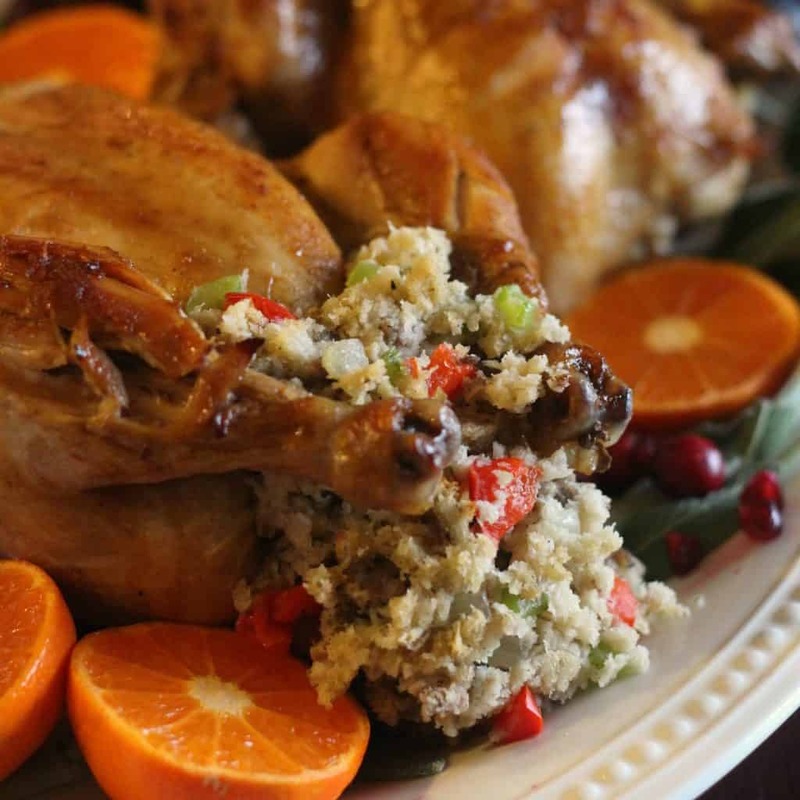 When the stuffing is stuffed into a bird, it’s so important to ensure that the stuffing reaches a safe temperature before serving. This means that the hens could overcook and dry out before the stuffing inside reaches a food safe temperature. 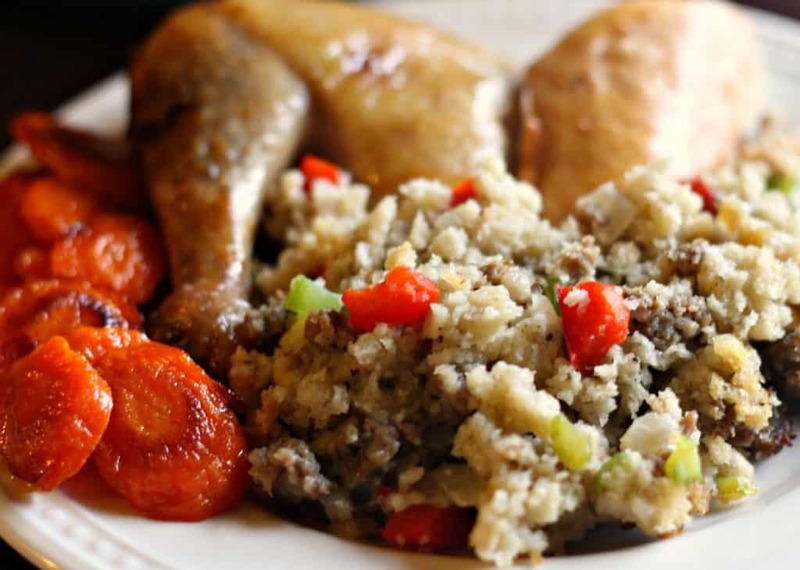 So I cook the stuffing on the side and then stuff some into each game hen before serving. 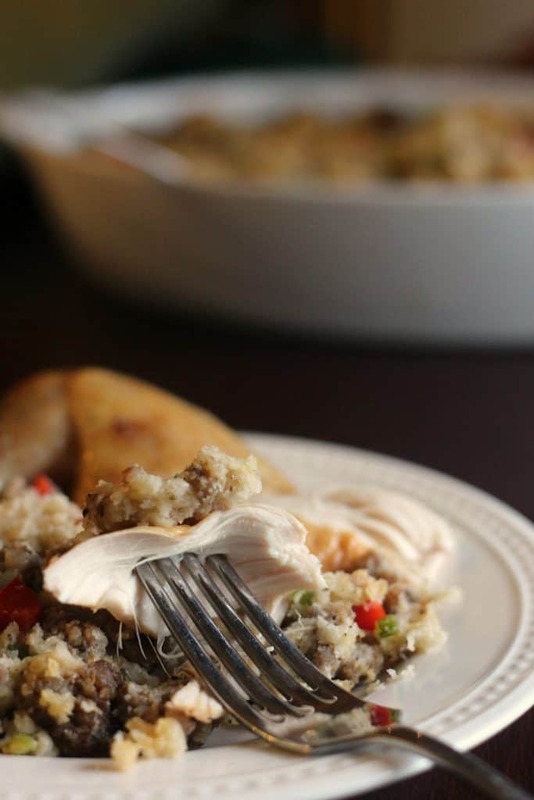 It’s the best way to ensure a juicy, moist hen and perfectly cooked stuffing. 1. Mix together the water, 1/4 cup of the Kikkoman® Soy Sauce, orange juice, 1/4 cup of the brown sugar, salt, allspice, cumin, cinnamon, and tumeric. Place the game hens in zip top bags and pour the marinade evenly over them. Seal the bags and place them in the refrigerator to marinade for 8 hours, or overnight. 3. 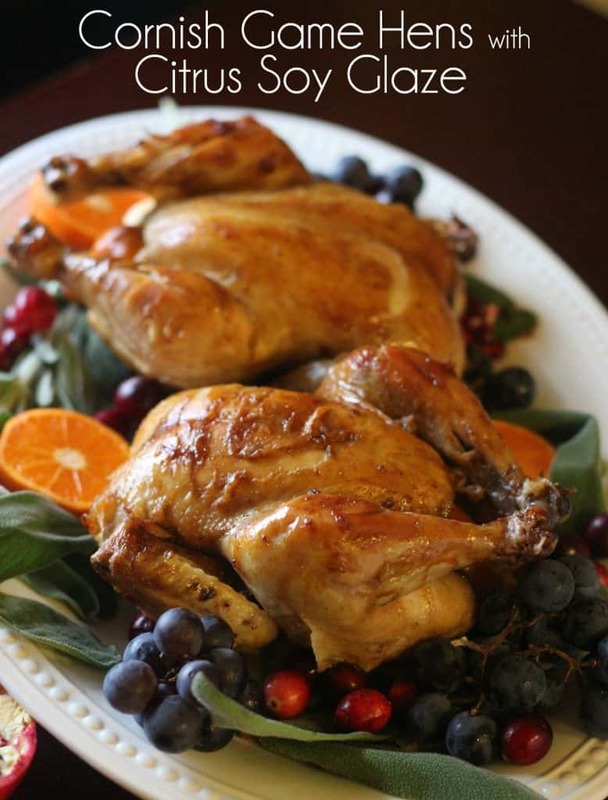 Remove the game hens from the marinade and place them into a large roasting pan. Reserve one cup of the marinade. Stuff the cavity of each hen with one quarter of the orange then tie the legs of each hen together with kitchen twine. 4. Roast the hens at 400 for 90 minutes, or until the hens reach 160 degrees. Roasting time depends on the size of the hens, so begin checking the internal temperature with a meat thermometer at 45 minutes to be sure they do not overcook. 5. While the hens are roasting, pour the reserved marinade into a small sauce pan and simmer over medium heat for about 15 minutes. Add 1/4 cup of the brown sugar and 1/4 cup of the soy sauce and simmer over medium heat until thickened. Keep the glaze warm and thin with a little water if it becomes too thick. 6. When the hens have reached 160 degrees, remove them from the oven and use a basting brush to coat the top of each hen with the glaze. 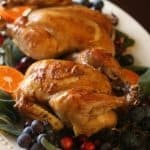 Return the hens to the oven to continue roasting for an additional 15 minutes, or until they reach an internal temperature of 165-170 degrees. 2. Cook the sausage, peppers, celery, and onion in a large skillet over medium heat for 10 minutes or until the sausage is completely cooked. 3. 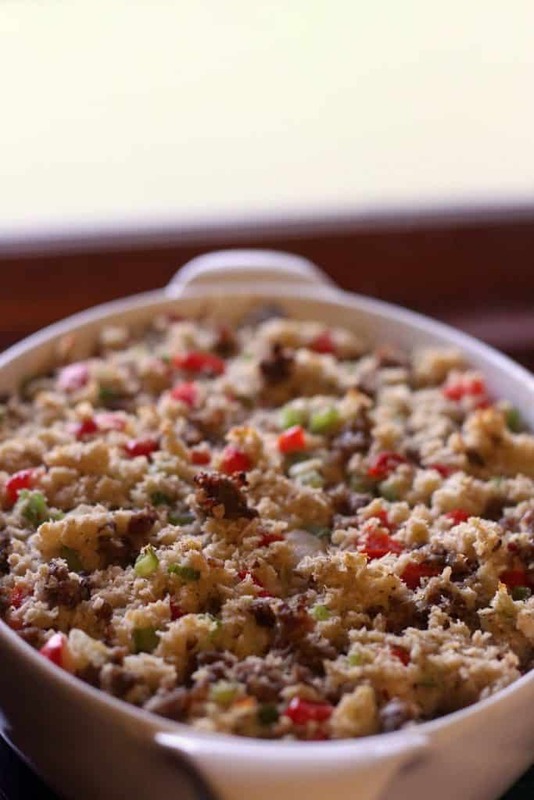 In a large mixing bowl, stir together the sausage and pepper mixture, panko bread crumbs, poultry seasoning, celery seed, sage, and chicken broth. Spoon into a lightly greased casserole dish. 4. 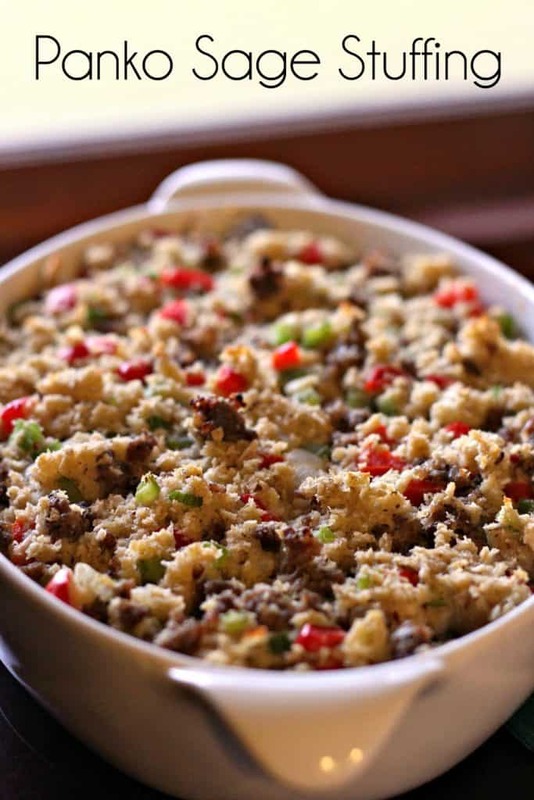 Bake the stuffing for 30 minutes at 375 degrees. You may wish to serve your hens on a big white platter, like I did. Use Concord grapes, sliced oranges, fresh sage, quartered pomegranates, and fresh cranberries for garnish to create a show stopping presentation. 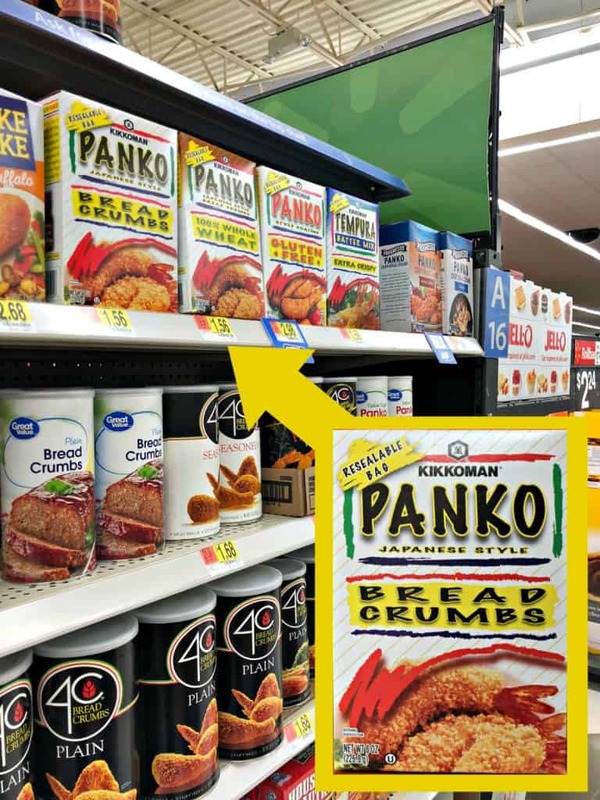 Click on the banners below for great savings on Kikkoman® Soy Sauce and Kikkoman® Panko Bread Crumbs from Ibotta. Click here now for more holiday inspiration. Enjoy your holiday eating! Yummy!!! It is midnight right now and seeing those pictures makes my mouth water. 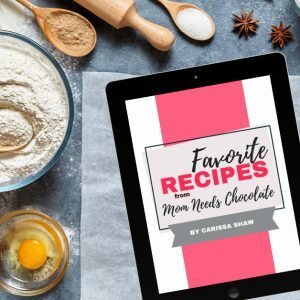 Thanks for sharing wonderful recipes! Wow! 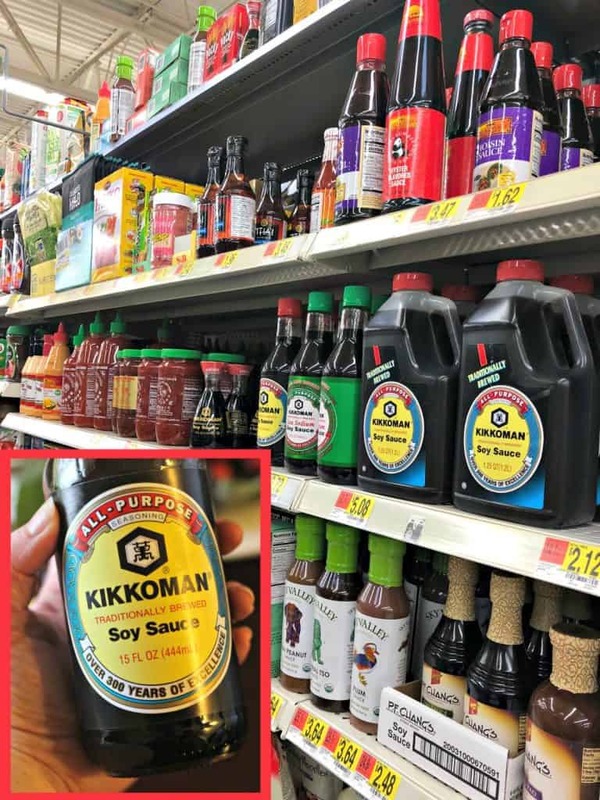 I only use Kikkoman for asian recipes so this is a new idea for me! I didn’t know it could be used for other non-asian recipes! 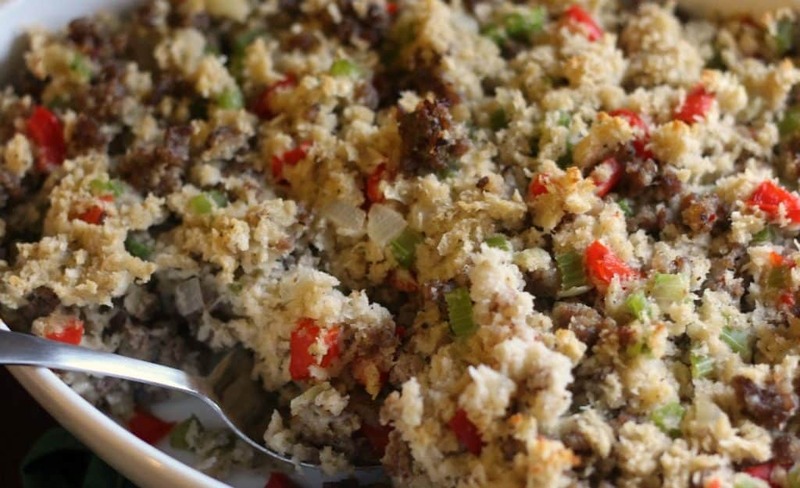 Stuffing isn’t limited to the holidays. Also great for all year round! Love it. Yum! I know that the soy sauce is what gives it the kick. And I like to use panko. Sounds really good. Wow! 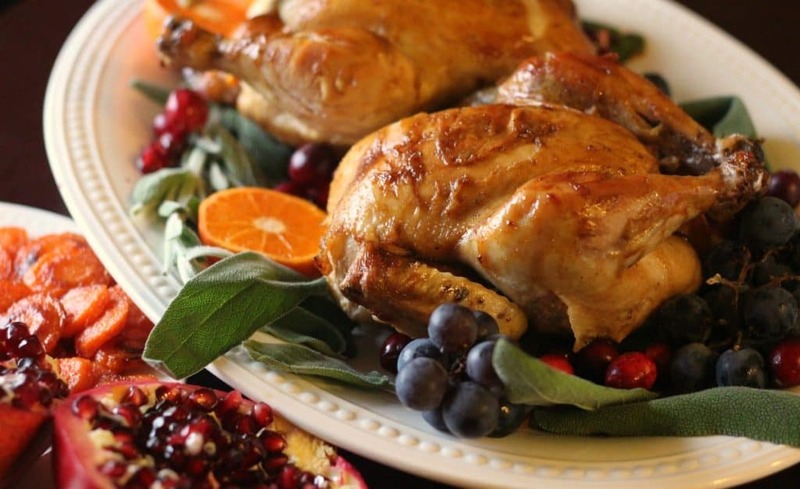 This is certainly an elegant meal for the holidays. Great photos! Those Cornish hens look delicious. It is wonderful to change up meals from time to time. 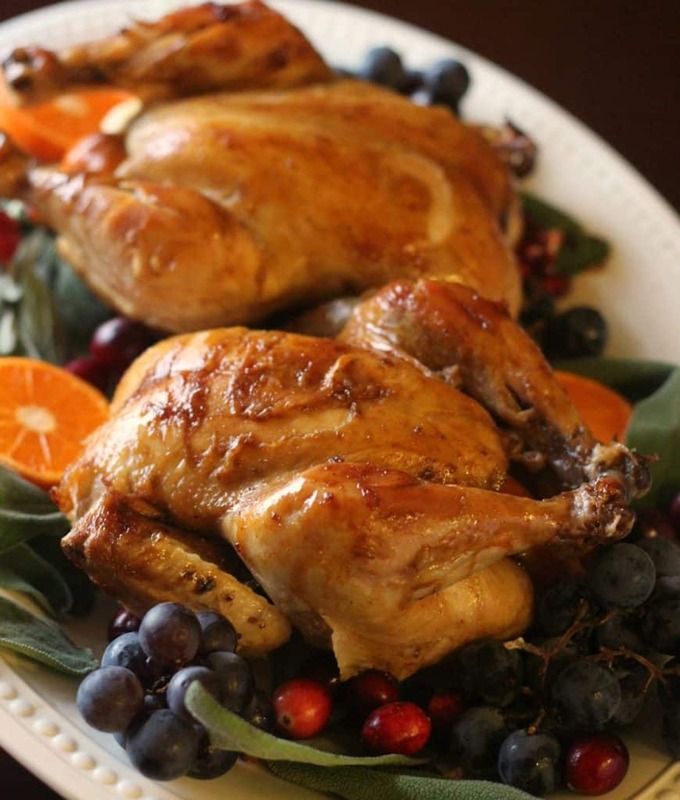 Cornish hens are a great alternative to the usual turkey or chickens feasted on during the holidays. Everything looks so delicious, especially the stuffing! My family is in love with soy sauce! I love these recipes, very unique and nice-looking.